This issue is made up of research findings presented at the 37th Clinical Aphasiology Conference in Scottsdale, Arizona, in May 2007. 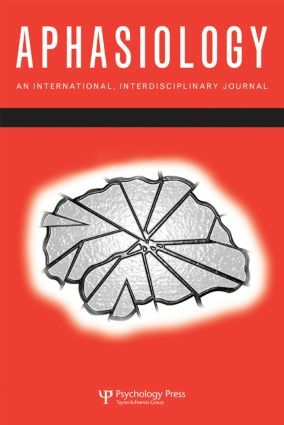 In keeping with the mission of CAC to foster new and innovative methods of assessment and treatment, and to stimulate scholarly discussion, the papers span the spectrum of approaches to aphasia and related neurogenic communication disorders, and present the very latest thinking in the field. Since its inception, CAC has promoted the development of research in clinical aspects of aphasiology, with the focus being on improving the communication between those with aphasia and their significant others. The papers in this issue continue this focus, with authors integrating theoretical and practical issues in order to forge ahead in this endeavour. From analysis and treatment of specific linguistic behaviours to interviews with people with aphasia and their families, to careful description of treatments involving everyday conversations, the papers demonstrate the range of approaches now possible in the treatment of aphasia. Further developments and potential integration of these different perspectives promises an exciting future for aphasia therapy. B. Armstrong, Introduction to Special CAC Issues of Aphasiology. R.B. Fink, M.R. Bartlett, J.S. Lowery, M.C. Linebarger, M.F. Schwartz, Aphasic Speech With and Without SentenceShaper: Two Methods for Assessing Informativeness. M. Rose, G. Sussmilch, The Effects of Semantic and Gesture Treatments on Verb Retrieval and Verb Use in Aphasia. P.M. Beeson, K. Rising, E.S. Kim, S.Z. Rapcsak, A Novel Method for Examining Response to Spelling Treatment. P.J. Doyle, M.R. McNeil, K. Le, W.D. Hula, M.B. Ventura, Measuring Communicative Functioning in Community-Dwelling Stroke Survivors: Conceptual Foundation and Item Development. V.B. Fleming, J.L. Harris, Complex Discourse Production in Mild Cognitive Impairment: Detecting Subtle Changes. E. Albright, B. Purves, Exploring SentenceShaper: Treatment and Augmentative Possibilities. E.S. Kim, K.A. Bales, P.M. Beeson, Instruction Processing in Young and Older Adults: Contributions of Memory Span. Y. Rogalski, L.A. Edmonds, Attentive Reading and Constrained Summarization (ARCS) Treatment in Primary Progressive Aphasia: A Case Study. A.D. Patel, J.R. Iversen, M. Wassenaar, P. Hagoort, Musical Syntactic Processing in Agrammatic Broca's Aphasia. R.M. Cameron, J.L. Wambaugh, S. Mauszycki, Effects of Age, Gender and Education on Semantic Fluency for Living and Artifact Categories. C. Croteau, G. Le Dorze, C. Morin, The Influence of Aphasia Severity on How Both Members of a Couple Participate in an Interview Situation. J.L. Harris, S. Kiran, T.P. Marquardt, V.B. Fleming, Communication Wellness Checkup ©: Age-related Changes in Communicative Abilities. M.L. Henry, P.M. Beeson, S.Z. Rapcsak, Treatment for Lexical Retrieval in Progressive Aphasia. J.K. Gordon, Measuring the Lexical Semantics of Picture Description in Aphasia. C.C. Mitchum, R.S. Berndt, Testing the Interplay of Structure and Meaning in Aphasic Sentence Production. M.C. Duff, J.A. Hengst, C. Tengshe, A. Krema, D. Tranel, N.J. Cohen, Hippocampal Amnesia Disrupts the Flexible Use of Procedural Discourse in Social Interaction. C.M. del Toro, L.J.P. Altmann, A.M. Raymer, S. Leon, L.X. Blonder, L.J. Gonzalez Rothi, Changes in Aphasic Discourse After Contrasting Treatments for Anomia. J. Lee, L.H. Milman, C.K. Thompson, Functional Category Production in English Agrammatism. S.C. Mauszcki, J.L. Wambaugh, The Effects of Rate Control Treatment on Consonant Production Accuracy in Mild Apraxia of Speech.